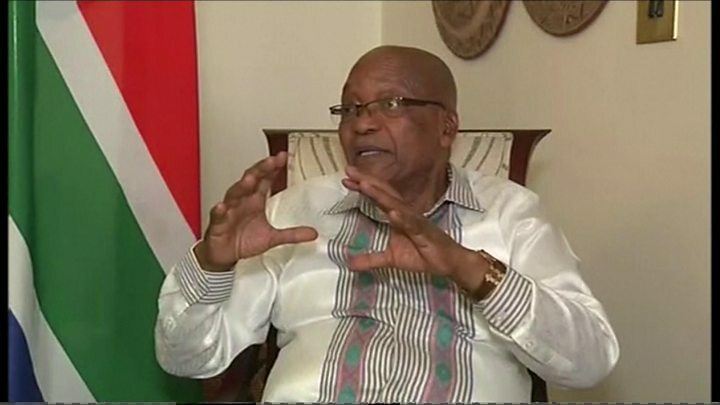 President Zuma told SABC he had offered to go after June, but objected to the way the issue was currently being handled. He said he would make a further statement later on Wednesday. The ANC said it had noted Mr Zuma's televised comments but would await his promised later statement before responding further. Earlier, ANC chief whip Jackson Mthembu announced that a motion of no-confidence in the president would be heard on Thursday, with Mr Ramaphosa sworn in as the nation's president as soon as possible after that. A meeting of the ANC's National Executive Committee had announced its decision to recall Mr Zuma on Tuesday and gave him until the end of Wednesday to resign. Why was the Guptas' house raided? Three people were arrested during the raid, with local media saying two more expected to hand themselves in. A lawyer for the family told Reuters that none of the three Gupta brothers - Atul, Rajesh and Ajay - were among those arrested. According to a statement released by the Hawks - the police's elite high-priority crimes unit - the raids were carried out in connection with the Vrede farm investigation. That investigation relates to the Estina dairy farm near Vrede, in the Free State, a project which was originally meant to help poor black farmers but from which the Gupta family are alleged to have pocketed millions of dollars, allegations they deny. A tranche of leaked emails released last year alleged that some of the money ended up paying for the family's lavish wedding at Sun City, South Africa's upmarket holiday resort. In January, the Hawks raided the offices of the Free State premier, Ace Magashule, looking for documents linked to the project. Mr Magashule was elected secretary-general of the ruling African National Congress (ANC) in December. Who are the Gupta family? The Gupta family own a range of business interests in South Africa, including computing, mining, air travel, energy, technology and media. The three brothers moved to the country in 1993 from India, just as white-minority rule was ending. They are known friends of President Zuma; his son, daughter and one of his wives worked for the family's firms. The brothers have been accused of wielding enormous political influence in South Africa, with critics alleging that they have tried to "capture the state" to advance their own business interests. What is the political fallout? The wrangle over Mr Zuma's presidency has caused political upheaval in South Africa and threatened to split the ANC. Last week's scheduled state of the nation address was postponed amid fears it would be disrupted by Mr Zuma's opponents. Mr Ramaphosa has vowed to revive the ANC's failing popularity by cracking down on corruption and cronyism. Elections are due in 2019 but the opposition is demanding they be brought forward.